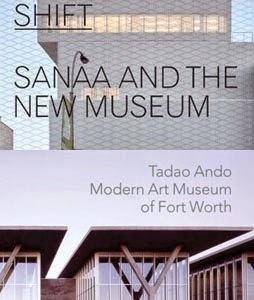 These two books on two recent museums by Japanese architects -- 2005's Modern Art Museum of Fort Worth by Tadao Ando and last year's New Museum in New York City by SANAA -- are as different from each other as the buildings and their locales. Where the former's horizontality and repetition relates to its larger and immediate context, the latter's varied verticality relates to its prominent and deeply historical Manhattan site. The books cater, respectively, to a more general, cultured audience and architects in particular. Even though the Modern's site in Texas outside Dallas is a significant part of its being, it is not as important -- to the architect and the author -- as its location across the street from the Kimbell Art Museum, Louis I. Kahn's masterpiece of concrete and light. The Modern's six parallel bays reiterate the Kimbell's famous ellipsoid vaults, but the differences between the buildings are stronger than this intentional similarity. The scale of Ando's building and its interior spaces is much larger than Kahn's intimate gallery spaces. Additionally, where the Kimbell's relationship to its green site occurs at the front door -- with small internal courtyards helping to make the focus of the museum an introverted one -- the Modern turns its back to its context -- placing a parking lot between it and the Kimbell, of all things -- by focusing on a pond cradled by the six bays and the elliptical cafe. Jodidio's book includes a lengthy essay on the building and the architect, with extensive quotes from the latter, many taken from curator Michael Auping's Seven Interviews with Tadao Ando, a book highly recommended for insight into Ando's approach to architecture. Jodidio's text is accompanied by numerous photographs and sketches, primarily the former. Auping contributes a section on how he chose art for the primarily non-white-box gallery spaces of Ando's creation. His text illustrates how important the role of the curator is in the success of museum architecture; a museum that doesn't successfully interact with art is not a successful museum. The New Museum, on the other hand, sits in the densely urban context of Manhattan. Here zoning restrictions dictate more than iconic neighbors, though the grit and history of the Bowery is certainly an important aspect of both the New Museum's site selection and the architect's approach to the building's appearance. SANAA's primary design gesture is to shift six stacked boxes, addressing both the site's zoning envelope and the desire for natural sunlight in the galleries. Outside of the main floor's transparent wall, the building closes itself off from its context, layering an aluminum mesh over a white backdrop to create a sometimes shimmering and ethereal skin. This appealing aspect of the design receives a good deal of attention in this book, as do other details, from its "hidden" stair to the small gap between the floor and wall at the building's perimeter. The drawings and description of the latter are a good example of how this book is aimed at architects. Being one, I can admit it's a very interesting read, like hearing about the difficulties that SANAA and the local architects had to deal with, such as the way subtle shifts in the apparently seamless mesh would affect the rest of the building. The greatest difference between these two books comes across is what both books share, the requisite photographs of their interiors. Where the New Museum's admittedly white-box gallery spaces (the antithesis of Fort Worth's galleries) are presented with museum-goers as well as art, the Modern's galleries are primarily empty. These opposite means of presentation say more about the museum themselves than just the architecture: the empty galleries of the Modern show the importance of the permanent collection and the "site-specific" relationship of the art with the building, while the crowded galleries of the New Museum are in tune with a museum focused on the new that provides a neutral backdrop to the ever-changing exhibitions. The art world has room for both these approaches, and each could exist in the other city, in a different guise, as these two buildings make clear that context is as important as what's inside.